He was a reticent, I could tell. He demonstrated a subtle kind of panache, a cool sort of sobriety, sitting a row above the group of chattering maestros engulfing two American girls. Jess and I had landed in the heart of South America with little more than a touchy four wheeler, two battered suitcases and a bag of foreign coins. And finding ourselves at a local soccer match with new friends, in an exotic, mountainous village 200 miles into a thick, lush rainforest, we swore we had found paradise. They were teaching us the rules, speaking rapidly in heightened animation. With each phrase we mimicked came an ejaculated si, si from our new friends. Phones were passed hand to hand, pics snapped absent-mindedly, and an intermittent cheer for the goalie. Words, it became clear, were useless — unnecessary, even. We resorted to other means of communication: hand motions, gestures, a game of charades and a repeated vamos, a word that had come to encompass so many more meanings: yes. now. go. act. move. pursue. ascend. fly. He was taller than the others and, I presumed, older. He stood apart, speaking only when probed for a translation. He knew english, and had overheard Jess and I when we assumed ourselves beneath the guise of a language barrier. The way he knew the words both sides needed to communicate but withheld them, gave him an ascribed sort of power, an esteem among the others. Something about that, his insinuating silence, captured my intrigue. I had to make him out. I entreated delicately: an imploring question — direct, yet subtle. He returned. It became an inquisition: a play of the cards. my draw, then his. a move and a response. They wanted to treat us to our last night in Monteverde, they said, as we stepped away from the arena. We followed. He kickstarted his bike, calling my name. I jumped on and we flew across the bumpy road of that small, uncharted rainforest. 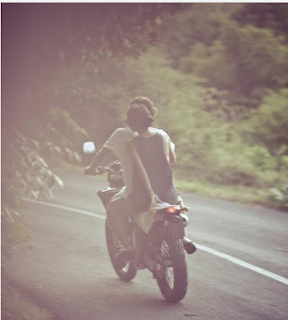 I could see the pull of his veins as he held the handlebars of the old motorcycle with familiarity. He weaved in and out of jungle terrain, flying past large, wet foliage and ducking beneath low-hanging bunches of bananas. I lifted my eyes to see a sky full of stars, splattered across the sky like diamonds unstrung. He eased off the gas and I brought my arms outward. As he put on the brakes and I beheld a view that made my pulse quicken. There, at the peak of Monteverde, a panorama of a magnanimous jungle stood before me, cocooning the distant chattering of monkeys and whoops of playful birds below the settling mist. A dense, humid wilderness wild with life, with a pulse, its own heartbeat. The top of the world, he said easily. How loosely rang the rhythmic cadence of his tongue in the presence of his own, but here words were sparse and chosen with care, as if the telling itself would cheapen all that the silence suggested. Words were unconfined by the jurisdiction of a definition, each infused with new meanings and connotations that challenged the mediocrity of commonplace words. Lacking access to verbal communication made it so much the more tantalizing. We were fraught with the need to share, to tell, to let loose the billowing surge of something from within. I told him I didn't want to leave this place. He said he never intends to. And there in the silence, I laughed. Then he laughed. There was no reason. No witty aphorism or comical remark to warrant it, but there we were snickering into the vast magical darkness purely as a release of uncontainable awe amid such splendor. Perhaps the impermanence of it made it all the more magical. And I fell all over again, for not a man but a people on this night in which so much was said, but so little was spoken.